Have you HUGGED your professional brand lately? 10 Must-Do's! The new year is almost here and with it, a chance to have the best of your career. Whether you're self-employed or work for a small or large company, that will mean building and strengthening your professional brand. 1. Realizing branding does apply to you. If you're a c-level executive, a college-student, entrepreneur, SMB owner or somewhere in between branding can take your career to the next level. Your brand reflects your reputation -- what you're known for (or would like to be known for). No matter what level you are in your career you want to be known for something. As a student and near graduation, your value online is key to your upcoming professional opportunities. As a c-level executive looking to increase company product/services sales think how the company has already helped so many others. What are the measurable results that prospectives need to know? 2. State who and what you are (not what you're not). Our branding should be consistent from beginning to the end. We don't want to overstate just to arrive at an interview or meet with a prospective client and then not be able to deliver the BOOM. Showcase your accomplishments & expertise online but don't overinflate to the point that execution is not possible. 3. Prepare now and reap the benefits when needed. Preventative is better than cleaning up our online brand after it's too late. We all know preventive healthcare catches the small health issue before the small becomes a big, right? Taking care of your 'digital self' before you are forced to is less costly and intrusive. Scenario: You've been happily with the same company for 10 years. You learn on a Monday that come the following Monday a major downsizing will be happening. You panic in disbelief that many of your responsibilities will be laterally distributed amongst 5 of your colleagues. You know your position is in jeopardy and you only have 1 week to scramble to find a new one [or at least begin the process of getting noticed]. In a hurried-rush you look at your resume and say to yourself "this hasn't been updated in 10 years." Many only realize how important their professional branding is once they have a career crisis and need to find a new position, stat. It's ok - we all do it. Preparing before-hand makes things a lot easier. 4. Honestly, ask yourself what is your value proposition.?. Almost in the same way you would prepare for a job interview, it's important to write down your core strengths. Prepare a list. Ask yourself what has been my top 5 accomplishments in the past 5, 10, 15 years. You have many, of course, but which ones stand out the most that provided value to the company? Yes, this requires a lot of time (refer to #3 again). Determine now before it's too late. I've found it's best to do this while you're within the brick & mortar of the company you're currently with. When you're sitting at your desk with familiar surroundings and your professional world is in front of - the memory is more easily triggered as to how you've benefited the company. TIP: Place a notepad in the desk drawer. Pull it out every time you recall or complete a huge project. Write the project name down and a few words of how it benefited the company [great talking points for a job interview too], by the way. 5. Recruit the viewpoint of others during your branding process. We create our brand to impress others not ourselves, right? Well, sure we want to impress ourselves too but we also want the promotion, the new position etc. So, impressing others may hold more weight. Consult with others about what they see as your most positive attributes (family, friends, colleagues, a branding firm or content writer). You might be surprised that the perspective of your value may actually be understated. Taking your brand to an 'outsider' may actually bring to the forefront areas of expertise and accomplishments you may not have known about (hence, can't see the forest for the trees analogy). 6. Understanding that developing a brand takes time. Oh boy, this is a big one [again!]. Time to do it all. Well, one thing is for sure LinkedIn can work for you 27/4 as can a website. But, a brand is more that your LinkedIn profile and your website. A brand is adding value wherever possible. What does this mean? Making yourself known daily or every couple days. 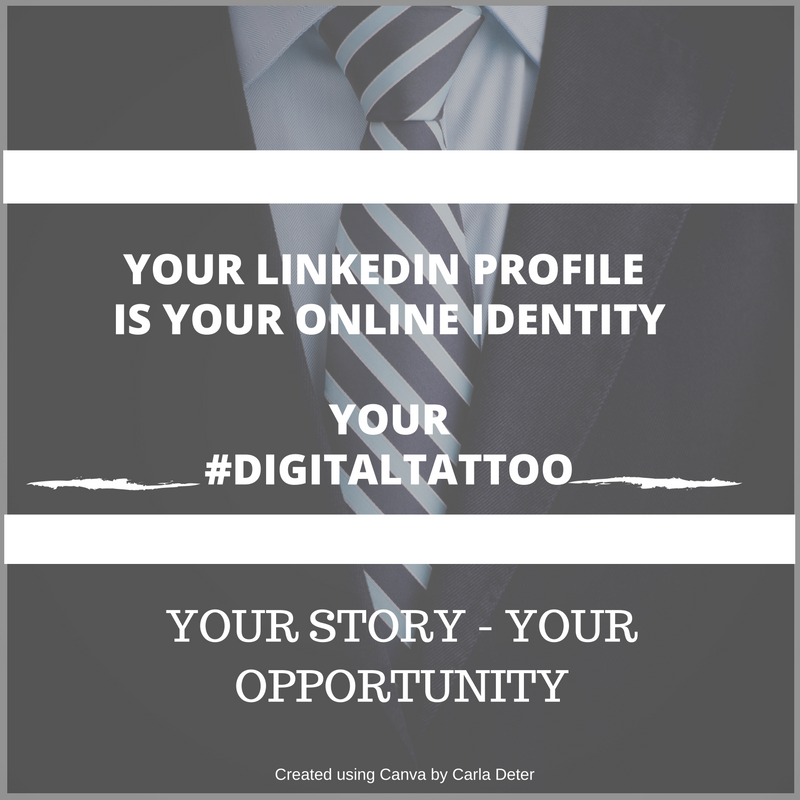 For example, once you've branded your LinkedIn profile and it's ready to be viewed (without a doubt that it looks good and conveys well) - then it's time to add the value. How? This happens over time! Developing your brand is adding value that results in you being seen and heard. It's about distinguishing you from your competitors. It's no doubt not easy. 1) Comment on industry posts on LinkedIn that are relative to your expertise. People ask questions - answer them. 2) Share leading industry articles that you relate to. Moreso, share articles from the exact companies you may be vying to work for. This will help too: [CHECKLIST] 5 Best Practices to Get Started on LinkedIn And Staying Connected - Don't worry, it's free & no email required! 8. Write your worth. Write what you know. Choosing a hot topic in your industry shouldn't be too hard. Choose one and start writing. Are you in sales? Getting started can be much easier if you envision a question that a client or prospective might ask about your product or service. Pose the question and answer it in an article. Boom! You've just proven you know what you're talking about. Are you job searching? Write about organizational change, IT infrastructure, the product development process or how you streamlined a process from 20 steps to 10 in less than six months. Add the methodologies behind it and provide how you were a part of making it happen. It's ok to share others content too. Definitely! But, you want to share original content that comes from you and your knowledge. Of course, share and refer to other industry experts with links and quotes. You've just proven that you did your homework. 9. Interact more than less. You don't want to be spammy. But, you also don't want to interact online only 1 time a month either. Remember, you're looking to gain attention to yourself, your company, your product/service, your potential new boss. If you post or reply to a comment to an article once a week you're going to get a lot more attention than if you only do this once a month. Decide what meets your schedule and time ability. Again, refer to the LinkedIn CHECKLIST mentioned above and place a day on each section. Column 1: Monday Column 2: Wednesday Column 3: Friday and so on. Do what works best for you. 10. Be Ready. Be Prepared. I've saved this for last but not because it's the least important. As a matter a fact - it's the most important. Get your digital self-ready for the New Year! 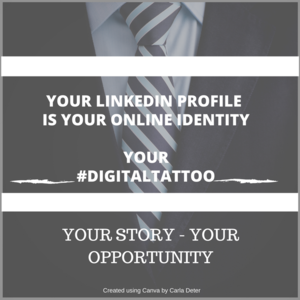 Your online identity is a given priority in today's busy digital world. 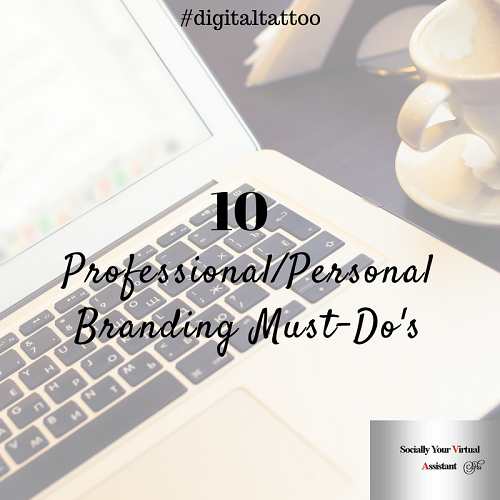 I like to refer to your online branding as a #digitaltattoo. Once it's out there - it stays out there. Have your professional branding ready to go and you'll be in a much better position when current clients, perspectives' or recruiters come looking for you. They will Google you, your brand, your product/service. Give them your best foot forward now and WOW them before they've even picked up the phone to contact you. Does your LinkedIn profile need some holiday TLC?